Here we go, it’s time for an Alice and Tika arc! Created with writing assistance from Locke, who came up with the ideas and early script. I ironed out the details and finalized dialogue and, of course, drew the fancy pictures. 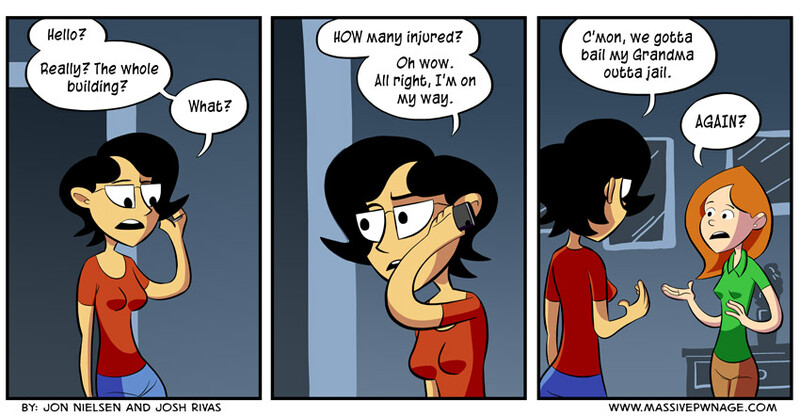 This entry was posted on Monday, October 15th, 2012 at 12:00 am and is filed under Comics. You can follow any responses to this entry through the RSS 2.0 feed. Both comments and pings are currently closed. So… her Grandma is awesome right? Why is Alice constantly having eye transplants? Seriously, she seems to have different eyes in every comic. I like these better, btw. Because I’m bad at drawing. Last time we saw her was from a distance so she had dots for eyes. She’s actually changed drastically over the lifespan of the comic cuz I had a super hard time learning how to draw girls. Oh, grandma . . .